You are here: Home / Blog / Blog / Limit Spam Traps In Your Email Database – 7 step guide. Do not harvest or scrape emails. Extracting emails from the Internet is the number one taboo move any email marketer can do. The most common placement for traps is the Internet. 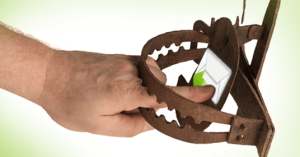 Spam trappers are betting that you will harvest their traps and send an email to it. Avoid scraping or harvesting online at all costs. Remove all hard bounces before sending. It would be advantageous to run your list through email verification in order to remove hard bounces before you send to it. Letting your list sit for a month will most likely accumulate bounces and ESP’s are not interested in removing them for you. They may suspend your account so make sure you remove all bounces before sending. Remove departmental emails ( also known as “Role” accounts). These are emails that do not belong to one person rather a department. No one signs up for newsletters using these types of emails so remove them. These are emails like info@, Sales@ or webmaster@ etc… There are hundreds of thousands of departmental emails so start gathering them for your filtering. Do not forget about other languages as well. Remove strange looking emails with numbers and letters (eyeball down your list). Who would sign up for your newsletter with an email like this h38dj47sj2l-0o@yahoo? A lot of these emails are bot seeds and could be spam traps from wannabe spam fighters (uneducated spam fighters). You can also find a good regedit program that can remove these so you don’t have to go through your emails one by one. Also look for weird looking domains like jsjtjsjse-akjshd.fsnet.co.uk. They may be nothing, but you shouldn’t take that risk. Also domains that are only numeric are usually questionable. Do not let your list sit. Old lists collect spam traps as mentioned above. Emails that sit dormant for a long time eventually get taken back ( mostly by free emails like yahoo, Gmail etc) and become honey pots. If you are a list owner, you need to be massaging your list at least once a week or so. A client of ours who gathered close to 800k records from a campaign they did years ago. Everyone who signed up for their campaign did so on their webpage. They let the list sit for 2 years while focusing on other projects. When they loaded the list into a major ESP, they hit 5 major spam fighter blacklists.